Young Life is an international organization whose purpose is to reach out to young people in genuine care and authentic friendship, supporting them and sharing with them the life-changing message of the gospel. 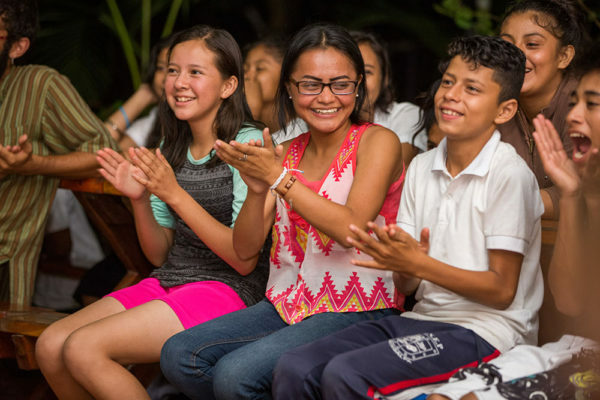 Rayo de Sol partners with Young Life Nicaragua by supporting/helping lead local Young Life clubs and making it possible for more students to attend Young Life camps. Youth in the community are invited to come just as they are, whether they are faithful church attenders or are street kids struggling with destructive behaviors. Regardless of their background, they are met with love and friendship. Weekly Young Life club gatherings provide a safe place for youth to have fun, play games, and hear a short biblical message. Those who are interested in further exploring faith are invited to experience “the best week of their lives” at Young Life camp, where they are given the chance to hear and respond to the gospel. Students who decide to follow Christ are paired with a mentor for one-on-one discipleship and are encouraged to get plugged in at a local church. Once they reach maturity in their faith, they have the opportunity to disciple others and serve as leaders with Young Life. No matter where young people are in their walk with God, the goal of Young Life is always to provide a supportive environment where they are encouraged to take that next step.